Only the force exerted perpendicular to the blade has an actual affect. Thus the further from the ship that one places their stroke the greater "r" will be, the greater torque that will be made, and the more the boat will rotate from side to side. 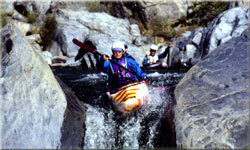 Crossing the Running River: One tactic of kayaking involves the canceling out of vectors to travel perpendicular to a river, tide, or any other flowing current. 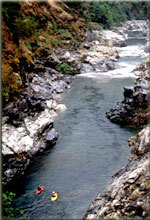 Suppose a kayaker is crossing a river that runs from north to south. He is located on the west bank at point P and wants to reach point Q, directly across the river (or tide or whatever) at a distance of 125 meters. The kayaker is able to travel at 5 m/s, and the current is running at 3 m/s. At this rate (according to distance equals rate times time) it would take the 25 seconds for the kayaker to cross. During that time, though, the current was also affecting the kayak, rushing him south, down the river, at a speedy 3 m/s. Thus he reached the other bank of the river, but 75 meters further south than he wanted. This can be avoided by kayaking at an angle to the horizontal. If he continues to travel at 5 m/s, and the river continues to flow at 3 m/s south, then by using the equation arcsin(3/5) = 36.869 degrees, it can be seen that the kayaker should travel his 5 m/s at 36.869 degrees north of east in order to arrive at the other bank with out having traveled further south. Looking at this in another light it can be seen that the kayaker has merely incorporated a vertical velocity (3 m/s north) to cancel out the current, and leave only a horizontal velocity (4 m/s east) to affect him. As can be seen, many different aspects of physics affect the sport of kayaking. An in-depth knowledge of these rules and laws, concepts and theories, and how they apply to an activity, can give any competitor the edge in any sport, including kayaking. 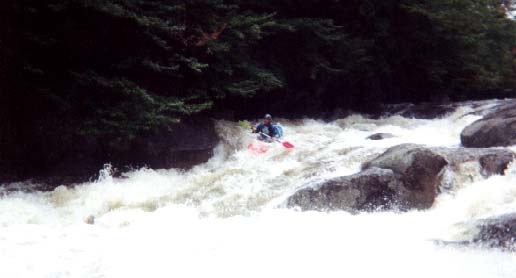 If you are serious about being a competitive kayaker, or even just want to improve your technique, I strongly suggest that you consider enrolling yourself in a physics program, perhaps at your local community college.